An earthy base to the sinuous creature brings the idea of forestry when glanced upon. A rich soil, pale and light. Not overly wide, she is long lengthwise for her height and smaller in stature than others in her size category. More slender with the grace of flowing water and less bulky than some. ear all of her seems hued with the same dirt tone with only the rose-cream to break up the monotony as it spills underneath her, flowing from the underside up the chest and underneath the chin, where it laps upwards to cover the maw. Her earthy frame toes lightly on the same rose-cream belly only presented as tipped paws; a dancer flowing through movements with just a flash of those paler toes often splayed for better traction. A feminist form, natural in its slender grace and overwhelming screech of beauty, carefully carved out of clay and painted in just the right places. Rose-cream is found above chartreuse eyes, two large ovular shapes that make for smoothed brows which bring forward a more expressive sheen to the overall facial structure. Just further above those painted brows begins a richer, deeper tone of brown, more sooty in appearance, that flows in a thick, solid stripe down the entirety of the lengthy female's back and ends just as the tail begins. An end to the curvaceous dancer's body is a thick gray-brown tuft of hair, pale and subtle in comparison to the sooty line and rose-creams of her undersides. Spiritual as they come, she is a believer of some divine essence existing and draws her strength from her ancestors when she is down on luck. There's neither an overly pessimistic or optimism that carries her daily, more of a middle ground that defines her life choices. She is lawful and will not cross over boundaries of life for the better good or evil, as all her ancestors were of the same belief there is a divine essence to guide life. Whatever greater purpose an individual serves will be shown through divine province in its own time. Neither kindly or mean the nymph is one of a great deal of balance by nature. Sugar does not drip from candied lips nor do deceits from shriveled husks. Straightforward is a more just path followed, with a tongue that speaks only what the eye sees and heart feels rather than guise her way towards things she wants. Rather simple in such a way, though not without intelligence. More of a sentient being filled with a strong value towards honesty, even at a price. Somewhat level-headed through weighing decisions provided a thorough mental exploration of each choice seems important to her, though she sometimes makes rash decisions based on emotional responses. Not exactly wearing her heart one her sleeve despite reactive moments the wood nymph is generally easy-going with a balanced response to most situation. Due to strict values she does not deviate from the laws of life, regulating within the boundaries at all times, tied back to her spiritual beliefs. 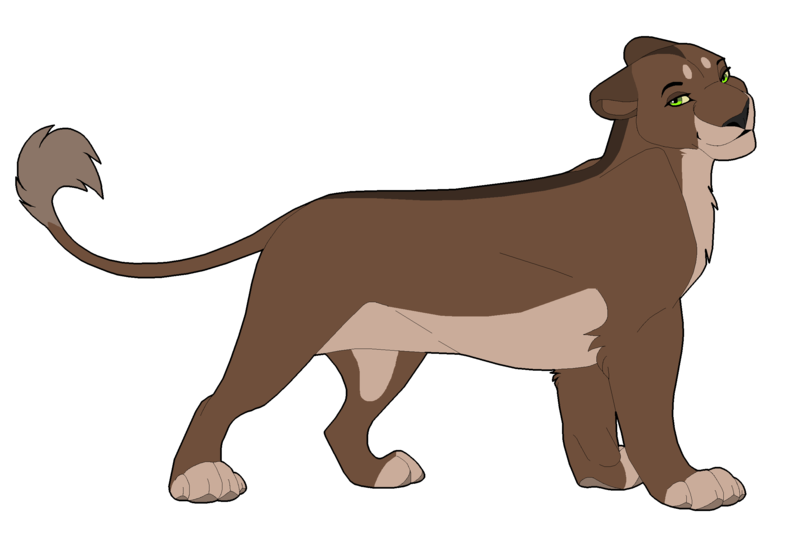 Hestia grew up in a primarily tribal pride of lions located in a deciduous forest. Strong ancestral worship lay among her pride, something that she would grow to be proud of and practice the prayers that her family instilled within her. There was not much amiss in her tribal pride. Each member gave something to the pride and her family was strong, proud; though each tribal pride within the forest she lived in was small, consisting of 10-15 members each. Rivalries between tribes were common and because of such so was war. Many often perished beneath the blood tribunals of each pride; even the more peaceful prides lost substantial members. Hestia's pride was somewhere in the middle between the prides classified as 'good' or 'evil'. Sometimes her pride would do whatever it took to survive through another war, another winter. There were times when they had to beg for mercy, praying relentlessly to their ancestors. --- "Get the cubs to safety!" A cry as Hestia's matriarch mother pressed through the battle ready crowd, seeking the milk maidens that cared for the cubs to urge them to the deep forest dens that were a solace in times of war. They would protect the young due to remote area, as the milk maidens were trained to hide their scents as they traveled at a quick pace. Cubs squalled as the males beat their war drums. Mud dripped down faces in tribal patterns and paw prints had been pressed messily into shoulder blades and chests. War was on the verge cascading over them. Hestia's mother lead the milk maidens down the secret path. Some old way passed down to the matriarch so that she could lead the cubs and milk maidens to safety in times of war. Hestia's father, the patriarch of the tribe, beat his war drum in a loud bellow as he rallied his brethren. They would come together to form a solid wall and rush upon those that would invade their territory to the death. He would survive this battle with ugly scars across his muzzle and chest, ultimately losing his sense of smell. It was the last battle until the moment of peace that would carry for a few years across their forest. --- Her mother and father had been born to this strife of tribal life, and though Hestia had been born during a lull of peace, they knew that wars would again be on the horizon. They conditioned Hestia to believe in the ancestors, to let them guide her, but also to leave the pride by the age of two. It was her father that instilled this the most in her, knowing that her brothers and sister would not have the chance to survive in the world that Hestia would come to know. Perhaps selfishly so, her parents had chosen just one cub to live, so as not to be condemned to death or banished by their tribe. When Hestia turned two her father took her on a "hunt" for a great predator. 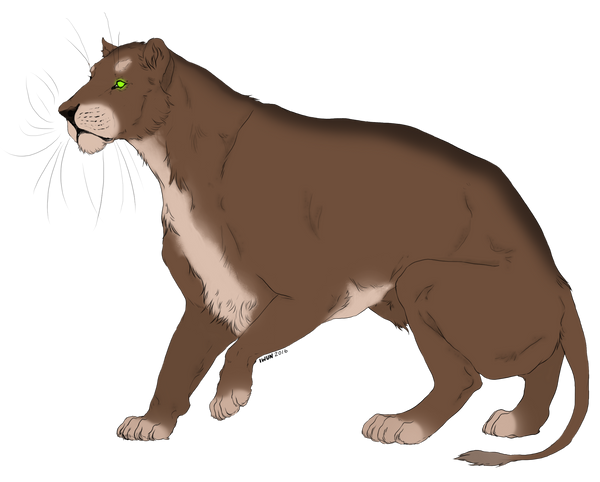 One of the traditions Hestia's pride partook in, sending pairs to hunt great predators for a yearly tournament. It would be easy to explain Hestia's death to a predator as great as a bear, when instead Hestia would make her escape from the forest she'd grown up in. The only place she loved. --- "Go now," her father's brow was stern despite Hestia's argument. "I will kill you myself Hestia. Leave this place and don't look back." Fury shook his large form, his fangs were bared and his paw raised to strike his child. "Father..." She knew in that moment to leave, as her father's eyes hardened and her choice made for her. With a heaviness in her chest Hestia turned away, her tail close to her thighs as she walked away from the only life she had known. No one had ever prepared her for a world outside of the tribal lands, suddenly it was upon her. There was only one direction to travel: toward Baraenor; a land that had been rumored to exist. Email: Send Hestia an email. Private Message: Send Hestia a private message. [ CHARACTER ] Dimensions: H: 3'5" L: 5'9" W: 318 lbs. "Get the cubs to safety!" A cry as Hestia's matriarch mother pressed through the battle ready crowd, seeking the milk maidens that cared for the cubs to urge them to the deep forest dens that were a solace in times of war. They would protect the young due to remote area, as the milk maidens were trained to hide their scents as they traveled at a quick pace. Her mother and father had been born to this strife of tribal life, and though Hestia had been born during a lull of peace, they knew that wars would again be on the horizon. They conditioned Hestia to believe in the ancestors, to let them guide her, but also to leave the pride by the age of two. It was her father that instilled this the most in her, knowing that her brothers and sister would not have the chance to survive in the world that Hestia would come to know. Perhaps selfishly so, her parents had chosen just one cub to live, so as not to be condemned to death or banished by their tribe. "Go now," her father's brow was stern despite Hestia's argument. "I will kill you myself Hestia. Leave this place and don't look back." Fury shook his large form, his fangs were bared and his paw raised to strike his child.